For now, VUO allows to export a composition as an app in a click, which is great for people who doesn't have Vuo because they still can run the exported composition. However, I believe that for the Vuo-ers (those who use Vuo ;)) to be able to use Vuo as an application creation software that allows them to distribute their crafted app, it needs some richer export features. I'm not even speaking here about to code-sign stuff and to apps to be App Store uploadeable (I don't know the Apple AppStore Rules). Slightly resized Licence Information Text Box. 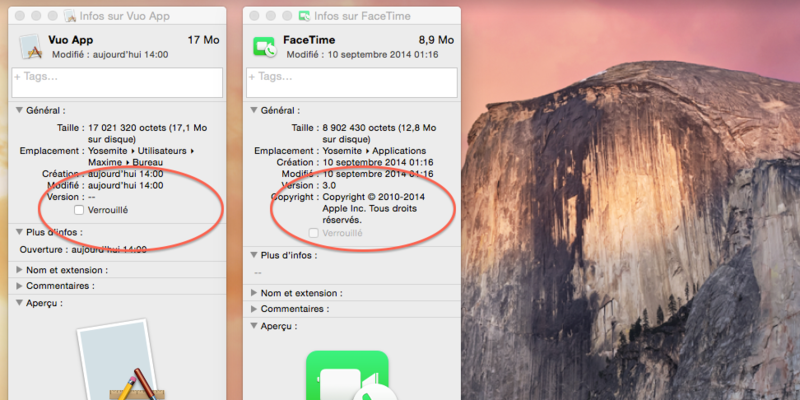 2 - A Finder Application Information Window with Copyright and version (See mockup below). I don't know how this could be done the best ? 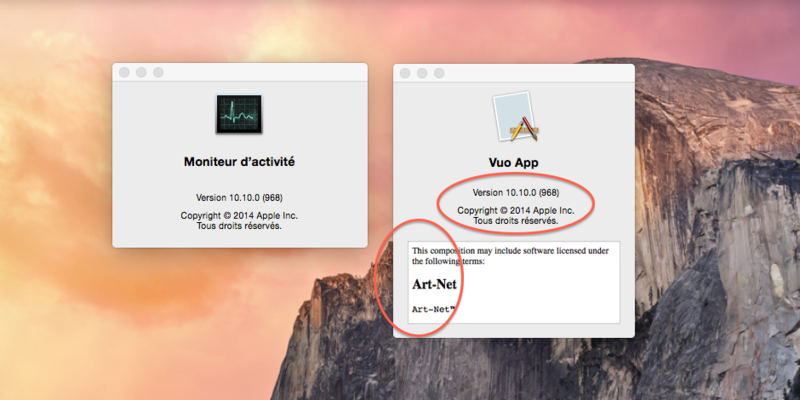 Perhaps when clicking "Export Mac App" a window could appear, inviting us to Add a copyright owner and an application version ? I have read the Vuo FAQ and specially the part "What Can I do with Vuo" "How might the GNU Lesser General Public License (LGPL) impact what I create with Vuo?". If I correctly understand those points, this feature request should be in terms with that ? I hope so because I love to export apps and I think it's a major Vuo feature for a lot potential users out there. Better not to have to repeat enter the data every time you export the application (which can be many in a single day). I went through this with Kineme's Quartz Builder. Better if the info is saved somewhere, also there's nowhere to enter Composition Info that I can find. Only example compositions seem to have Comp info text appear in the Node Library when no node is selected. A dialogue to store both or the one info that gets used for both would be good. We needed to make some improvements to composition metadata anyway for Vuo 1.3, so it made sense to include this feature request — marking as chosen. Cool. Is Code signing part of it or should we create a separate Feature Request ?